South Jordan City Hall is located at 1600 West Towne Center Drive (10610 S), South Jordan, UT 84095; phone: 801-254-3742. 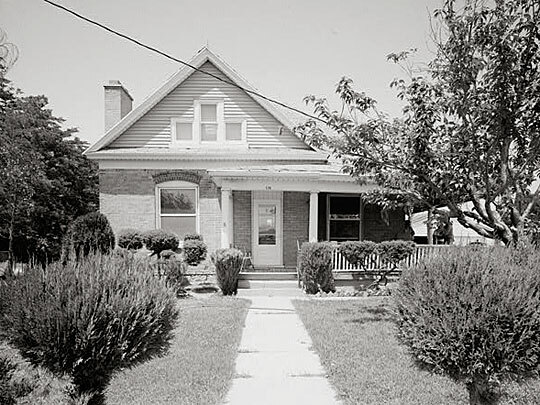 Photo: Richard M. Fairbourn Farm House, South Jordan. The house structure is a good example of a modest Queen Anne cottage of a type commonly built in Utah between about 1885 and 1905. The Queen Anne was the most popular Victorian style built in parts of urban Utah during the late 1800s. A number of Queen Anne homes have been found in Utah rural settings near urban center. [Aleksander Kecor, photographer, June 1992, Historic American Buildings Survey [HABS UT-131], memory.loc.gov, accessed May, 2012. South Jordan was settled in 1857 by Alexander and Catherine Lince Beckstead. The Beckstead Ditch, built by the family, still exists today. The ditch diverted water from the Jordan River to irrigate crops. South Jordan was primarily a rural farming community when it became incorporated as a town in 1935. In 1960, the population was 1,354, and by 1970 the population had more than doubled to 2,942. Housing gradually started to replace farmland as the population once again more than doubled by 1980 to 7,492 and nearly doubled by 1990 to 13,106. South Jordan's exponential growth since the early 1970s has brought challenges and opportunities. The current estimated population of South Jordan is 47,356 (per the City of South Jordan, October 2006). South Jordan's most distinctive and recognizable landmark, visible from miles around, is the LDS Jordan River Temple overlooking the open space and protected green belts of the Jordan River Parkway. Though residential development in the Salt Lake valley has skyrocketed, South Jordan is committed to preserving its natural beauty. Along the banks of the Jordan River, South Jordan City is working with other government, non-profit and private groups to preserve open space as part of the South Jordan Riverway Wildlife Enhancement project. City of South Jordan, UT, South Jordan Utah Parks, Recreation, Trails and Open Space Master Plan, February, 2007, www.sjc.utah.gov, accessed May, 2012.